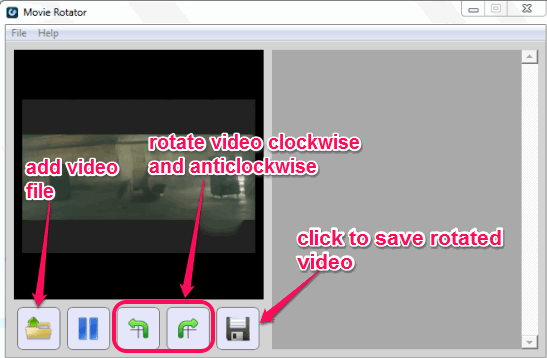 This tutorial explains how to rotate a movie or video file. Movie Rotator is a free software to rotate a movie in clockwise or anticlockwise direction. Apart from rotating your movie file, it also lets you save the movie in MP4 format. If any of your video file is in portrait position (vertically flipped), you can use this handy software to rotate it in landscape position. Movie Rotator can also be used as MP4 video converter for rotated video files (though, I would prefer to use it only for rotating videos). Refer to animation below to see how easily can this software rotate movies. There are a few media players, like VLC Media Player, that let you rotate playing video. But this software is very helpful for other media players which don’t support rotation feature. You may also check this similar software reviewed by us: Free Video Flip and Rotate. How To Rotate a Movie With This Free Software? Step 1: It’s a basic step as you simply have to download and install this freeware. You can use the link I have added at the end of this review. Setup file of Movie Rotator is only 488 KB and it is very lightweight. Step 2: Open interface of this software and add your video file. It supports WMV, 3GP, AVI, MOV, and MP4 video files as input. You can use Add icon or simply drop needed video on its interface. Step 3: Now to rotate input video file clockwise or anticlockwise, use rotating buttons available at the bottom of its interface. On the left side, you will be able to preview the changes. Note: Right part of its interface is not of any use as no options or any kind of other feature is available there. In my opinion, this part should be used to preview output video and left part should let users preview input video. Step 4: After rotating the video, you can save output video in MP4 format. You don’t have to compromise with quality of output video, which makes this software even more useful. This simple Movie Rotator is very useful for its purpose. Just few basic steps are needed to rotate and save your video. You can grab this software using this link.